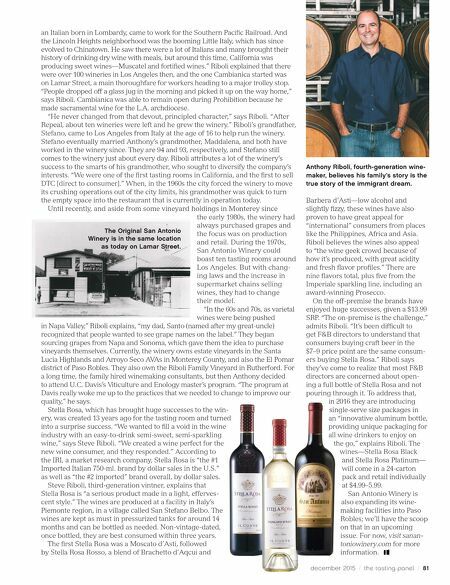 80 / the tasting panel / december 2015 WINERIES L et's be clear about something, right off the bat: San Antonio Winery is not in Texas. The founder, Santo Cambianica, named it after Saint Anthony of Padua. In operation since 1917 as a family-operated urban winery situated in downtown Los Angeles, California, San Antonio Winery is perhaps best known for its Stella Rosa wines, though altogether the winery produces many different brands. It is one of the state's longest-producing family-owned wineries, and the most- awarded winery in Southern California. Today, fourth-generation Anthony Riboli is Head Winemaker, while his father Santo is President. His uncle Steve is the Vice President, and his aunt Cathy manages the popular on-site restaurant called Maddalena (named after his grandmother, the winery's matriarch). "Our story is the story of the immigrant dream," says Anthony Riboli. "My great-great uncle, Santo Cambianica, Living the Dream The Riboli Family. Top (left to right): Santo Riboli, Cathy Riboli and Steve Riboli; bottom: their parents, Stefano and Maddalena Riboli. 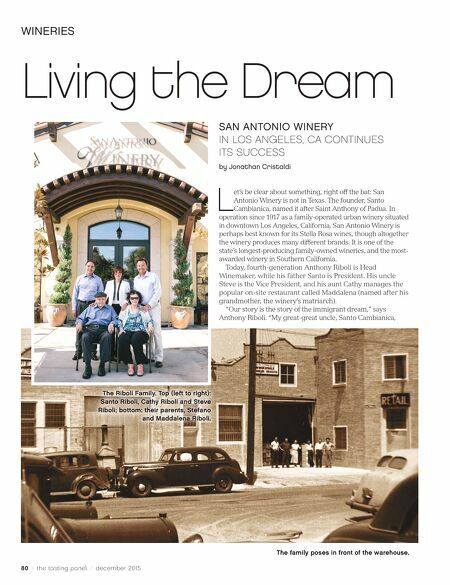 SAN ANTONIO WINERY IN LOS ANGELES, CA CONTINUES ITS SUCCESS by Jonathan Cristaldi The family poses in front of the warehouse.